Over time, truck scale accuracy can change due to a variety of issues, mostly usage and wear and tear. When you’re looking at a truck scale, accuracy is very important to your business because the value of the product you are transporting affects your bottom line and correlates to the weight you see displayed on the scale indicator. It can also be a safety concern as well, since truck weights must be in compliance with federal safety regulations. You might think that a small issue doesn’t mean too much but the truth is that just small inaccuracies on a truck scale that is used regularly can accumulate to large costs for your company over time. As you can see from the example above, small errors can add up very quickly. So, you might be thinking, but my scale was calibrated when it was installed, I should be good, right? Well, the initial installation, does not guarantee continued accuracy. When a truck scale is first installed, it is tested by the scale company and the state weights and measures, both using certified test weights. This is done to ensure the scale’s accuracy as well protect the scale buyer, seller, and the scale installation company. At this point, the scale is certified and ready for everyday use. However, the scale will need to be checked and adjusted at least a couple of times a year at a minimum. As you can see from the example above, just a few pounds of errors can cost your company a lot of money. It’s important to remember, scale calibration does not lock in forever. It is dependent on several factors such as frequency of use, weather, gravity, electrical currents etc…. can throw off the accuracy of a measurement device. The main point of this article is this. 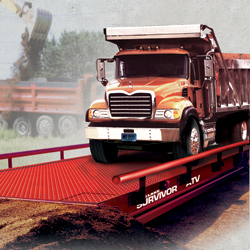 A truck scale should be periodically tested and adjusted if necessary. A commercial scale company, like Central Carolina Scale can check your truck scale on a regular basis or if you currently have a scale that has been “tagged out” by the state of North Carolina, CCS can check, test, and adjust your scale and get it back to weighing accurately. Give the service department a call at (919) 776-7737.